The 2018 SeoulTech Concert will be held in the Auditorium of the 100th Memorial Hall at 18:00 on Monday, 3rd December. The theme of this concert is “SeoulTech Becoming One Through Music.” It aims to promote cultural welfare and harmony among SeoulTech members through music performances by top professional artists. Classical music and popular songs will be selected for the winter concert and will be performed by a string quartet and male choir. We met with Professor Hwang Soon-hak, who oversees the event. Q. Please tell us about the SeoulTech concert. It is a classical music concert that used to be called “Fall Concert” and has been taking place annually since 2013. The concert will now be called “SeoulTech Concert” and will be performed by the string quartet ATTO led by violinist Shu Mi-Kyung, who has experience within Korea and abroad. The Bravo Bravismo men’s choir led by tenor Cha Mum Su, a professor of music at Suwon University, will also be performing. We will also prepare small snacks. Q. What is the composition of this concert? How were the songs chosen? The “SeoulTech Concert” will feature songs that represent the warmth of the winter and celebrate the end of the year. The song selection was based on artistic merit and popularity. Q. Will there be differences from previous SeoulTech concerts? In 2013, the KBS Symphony Orchestra, which is considered the best symphony orchestra in Korea, was invited. In 2014, the National Police Symphony Orchestra performed. 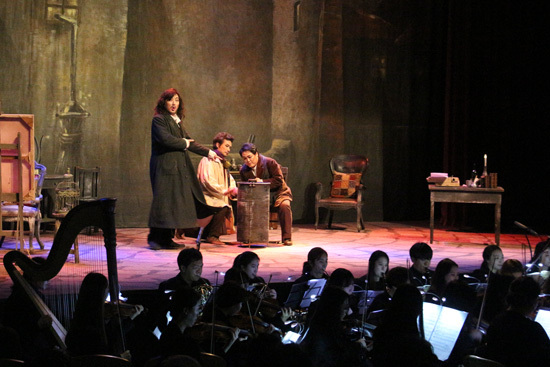 From 2015 to 2017, the operas La Tosca, La Triviata, and La Bohème were consecutively performed, showcasing orchestra performances with opera staging. The concerts were generally large-scale. For various reasons, unfortunately this year's concert will be somewhat smaller than previous editions. Q. What are you focusing on in preparing for the concert? As it will be a smaller concert than last year, we feel that we should focus on providing qualitative satisfaction to the audience. In order to raise the quality of the concert, we are focusing on better preparing the performers to select songs with artistic merit and popularity. Q. Have you been running into some difficulties? To host a successful concert, we need many SeoulTech community members to plan and prepare the performances. I would like to express my sincere gratitude to the Siheung Opera, the university's External Affairs and Cooperation Office, the SeoulTech Foundation, the Humanities and Social Sciences Administration Office, and the staff of the Facility Department and Public Relations Center for their hard work. Without them, it would have been very difficult to organize successful concerts over the years. Q. What background knowledge or advice could help the audience members enjoy the show more? Classics don’t really require background knowledge to be understood. That is, anyone can appreciate the music. If you are still hesitant, you may want to familiarize yourself with the pre-released program guides and listen to the sets online beforehand. Most classical songs are only designated by numbers. It can be fun to invent your own titles for the songs. Even if songs already have a title, naming them according to your own sensibility can deepen your appreciation of them. Q. Do you have any last words for prospective audience members? Unlike the studio recordings of popular music that are often broadcast by various mass media, classical concerts involve live performances. The music responds to the audience and the atmosphere of the day. These organic characteristics make the experience even more incredible. In other words, the performers create the music along with the audience. Therefore, genuine appreciation and sincere applause can create the best environment and encourage the performers to please the audience.